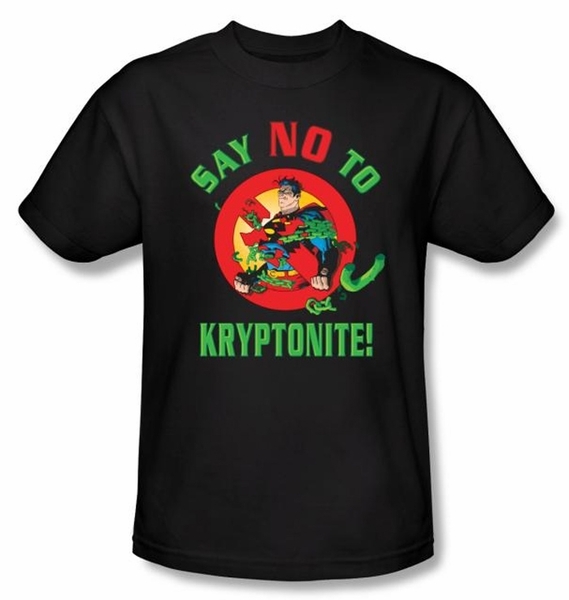 This Superman Black kids youth t-shirt features the man of steel with a public service announcement just say NO to Kryptonite. Just say no! Superman's greatest weakness is Kryptonite material from his home planet of Krypton, which dramatically weakens his powers and has the ability to cause great harm to the people of Krypton. Our Superman Tee Shirt is an incredible t-shirt for any Superman fan. Superman is the most celebrated superhero of all time. Nicknamed the Man-of-Steel, Superman was first published in 1932 by DC Comics and has enjoyed unmatched popularity for nearly 80 years. Our Superman T shirts are strong and stylish like the Man of Steel himself!